The first of two posts on the Bijapur manuscript Javāhir al-mūsīqāt, c.1570/c.1630 by guest blogger Katherine Butler Schofield of King’s College London. This manuscript has now been digitised and is available to read online on British Library Digitised Manuscripts. Follow the links below to go directly to the relevant folios. The dancer sinks into a deep plié, both heels raised with her toes planted on the ground, her shins at a distance of one hand span above the floor, both shoulders parallel with her knees, and the thumb and forefinger of each hand completing the circle of the haṃsāsya hand gesture, the “wild-goose beak”, as she demonstrates the third of three ād-sanj positions. As the dancers who follow her show more taxonomically, this scene is straight out of the Saṅgītaratnākara, the greatest Sanskrit music treatise of the second millennium CE, which the Kashmiri pandit Śārṅgadeva wrote for the Yadava king Siṅghaṇa (r.1210-47) at his court of Devagiri, now Daulatabad, in the Deccan. Śārṅgadeva’s work was considered seminally important in both North and South Indian musical traditions in the 16th century when this dancer was painted – a mārga (universal) treatise for all times and places. Yet the page across which she dances is also rooted in a particular desh (region): the text is Dakhni and in Arabic script, betraying its regional roots in the Muslim Deccan; and the dancer is indisputably trained in South Indian traditions. Not for her the flowing ankle-length robes and pajamas and cypress-like stance of her counterparts at the Mughal court. Bare-legged and sharply angled, she wears a short wide skirt like Baz Bahadur’s Mandu dancers, forced to perform in captivity for Akbar in 1561; and the longer skirts of her sisters in subsequent paintings are pulled up between their legs like trousers, in a manner reminiscent of today’s Bharatanatyam dancers. Both costumes are designed to accommodate legs bent wide in plié – still the iconic basic posture of South Indian dance today. She may be dancing her way through a Sanskritic taxonomy of mudrās and maṇḍalas (hand gestures and body postures), but her male companion is dressed in visibly Persianate robes and is sporting the tight conical turban characteristic of the 16th-century Muslim Deccan, specifically the ‘Adil Shahi court of Bijapur. This figure is slightly more difficult to interpret: is the rod in his right hand indicative of authority, perhaps of instruction? That he is apparently exemplifying the haṃsāsya gesture to the dancer – a gesture that was itself used in the Saṅgītaratnākara to signify “instruction” – certainly underlines that impression. Is he, perhaps, the dancer’s instructor? If so, is that not a little intriguing: a courtier embracing the Persianate styles of the ‘Adil Shahi court teaching the universal way of the Sanskrit treatises to someone trained in the regional dance forms of the South? 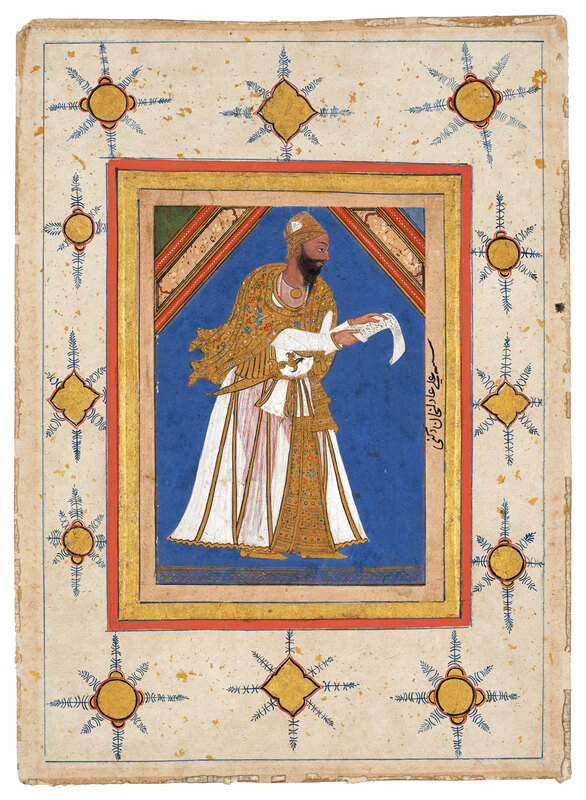 The multilinguality of the codex that yields this image, too, is as complicated as the painting’s cultural mixture: choice morsels of Dakhni scattered through a weighty Persian dish poached in a Sanskrit reduction and seasoned with judicious pinches of Sufi-infused Arabic (See Aitken below). Added to which there is confusion over its date: the paintings have the unmistakable savour of the court of ‘Ali ‘Adil Shah c.1570 – based largely on the blatant similarity of the paintings to the Chester Beatty Nujūm al-‘ulūm completed in 1570 for ‘Ali ‘Adil Shah (Michell & Zebrowski, p. 162 and Flatt below) – but the codex’s Persian dedication is to his great-nephew, Muhammad ‘Adil Shah (r.1626-56). How might we make sense of this work? For the past few years, I and my team on the European Research Council project “Musical Transitions to European Colonialism in the Eastern Indian Ocean” have been compiling information about all the major texts on North Indian art music and dance produced c. 1600–1900. The British Library possesses by far the largest and richest set of materials on North Indian music we have yet encountered. These include hundreds of paintings of the melodic modes of North Indian classical music – the male rāgas and female rāginīs – as heroes, heroines, jogis and deities, alone or collated together into sets called “garlands of rāgas” or rāgamālās. The rāgamālā paintings that form the centrepiece of Shaikh ‘Abd al-Karim bin Shaikh Farid Ansari al-Qadiri Jaunpuri’s masterwork, the Javāhir al-Mūsīqāt-i Muḥammadī, are quite possibly the Library’s oldest. The Javāhir al-Mūsīqāt-i Muḥammadī, the “jewels/essences of music belonging to Muhammad”, is not the British Library’s most beautiful Indian musical manuscript; its 48 miniatures have been deemed a crude, if charming, footnote to the productions of ‘Ali ‘Adil Shah (r.1558-80) (Michell & Zebrowski) and its calligraphy is somewhat slapdash. But it is undoubtedly one of the Library’s rarest – this is the only known copy – and one of its most important, for several reasons. 1) Firstly, in c.1570 an anonymous author prepared a densely illustrated Dakhni translation of the 13th-century Saṅgītaratnākara probably for ‘Ali ‘Adil Shah of Bijapur, but with the replacement of its rāga chapter with a much newer iconic rāgamālā. All the miniatures have passages of Dakhni prose on the reverse. These do not correspond to the painting on the front, but to the next painting in the section. By using digital images of the folios, it is possible to reconstruct large portions of the original treatise. The section on the seven notes of the scale (swara) – which has unique paintings of the swaras personified like rāgas – and the dance section are patently literal translations of the corresponding subchapters of the classic Sanskrit work of music theory, the Saṅgītaratnākara. 2) Around 1630 or so, Shaikh ‘Abd al-Karim, a Qadiri Sufi whose family hailed originally from Jaunpur in the north, split the Dakhni treatise apart and reused its paintings in a more elaborate and refined Persian translation for Muhammad ‘Adil Shah, with a Suficate preface and six chapters: the origins of sound; the musical scale; the rāgas and rāginīs; two chapters on the rhythmic system (tāla); and dance. This essentially forms the manuscript we have now. Shaikh ‘Abd al-Karim calls the work he is translating the Kitāb-i Sangīt, the “Book of Music” (e.g. Javāhir, f. 69v). This designation may refer to the Saṅgītaratnākara itself; the more traditional sections compare almost exactly. However the remaining Dakhni is also followed very closely, though with key interpolations from the Islamic sciences (see my next post). Sticking my neck out I would suggest Kitāb-i Sangīt refers to the Dakhni text. Even what remains indicates its textual portions were originally much more extensive. 3) At some point comparatively early in its long history, through wear and tear the manuscript lost its colophon, and the first few pages became so degraded that a second headpiece was reused to replace the original – you can see where the previous text was cut out – and the first few pages were retranscribed on newer paper. 4) Finally, by the time the codex was bound in its current form, what is now the third folio ended up bound out of place (folio four runs on from folio two), and several pages in the middle – all the rāg-rāginī illustrations for Rags Shri and Dipak and the beginning of the fourth chapter – had sadly gone missing. Where the English pencil folio numbering (followed for citations here) goes from 123v to 124r, the oldest Persian numbering skips from 141 to 177. Suddenly, from enjoying a description of Shri Rag, we find ourselves in the middle of a sentence describing the Sanskritic notation system for poetical and musical metre. The Javāhir is thus a multilingual palimpsest of three treatises layered up like an onion: a translation of the 13th-century Sanskrit Saṅgītaratnākara into 16th-century Dakhni, which was split apart and its paintings reused to form the central thread of a more elaborate and aspirational 17th-century Persian translation. This remarkable manuscript constitutes the earliest work of Indian music theory in Dakhni that we know of. But it is also the earliest music treatise in Persian that we still possess from the Mughal period. I will discuss the wider cultural and historical significance of this text in my next post. The term Ād-sanj appears to be a distortion of the Sanskrit term, asaṃyukta, for the “single hands” section that follows, but at the moment it’s not clear where the three subpostures come from. The British Library copy of the Ghunyat al-munya is often cited as unique, but there is at least one other: Corpus Christi College, Cambridge, owns a copy (Cambridge University Library, Corpus no. 884). M E Aitken, “Parataxis and the practice of reuse,” Archives of Asian art 59 (2009), 81-103, pp. 82, 97-100 for the comandeering of the Indian culinary term khichṛī, a rich stew of rice and lentils, to describe cultural and religious mixing in early-modern India. G Michell & M Zebrowski, Architecture and art of the Deccan sultanates (Cambridge, 1999). E J Flatt, “The authorship and significance of the Nujūm al-‘ulūm,” JAOS 131.2 (2011), 223-44. N N Haider, “The Kitab-i Nauras,” in N N Haider, ed., Sultans of the South (New York, 2011), 26-43. N M Titley, Miniatures from Persian Manuscripts) a Catalogue and Subject Index of Paintings from Persia, India and Turkey in the British Library and the British Museum (London, 1977) pp. 1-2.